Tatting decorations with beads is of special interest. These works look very rich and stylish, and some of the tatting models with beads are so exceptional, that they could have a high price, and in fact they are glorious like the real works of art. Nina Libin developed tradition of using beads in tatting. In 1988 she called this new tatting technique with beads Binil. Ankars is a new direction of volumetric tatting with beads and semi-precious stones mixed with others techniques. It was created in Russia in 1990s. Ekaterina Stepnaya, Angelina Rozanova, Angela Safonova are the creators of this beautiful technique. Ankars has not achieved wide distribution so far, but it deserves a special admiration for its unusual style and for its originality. Ankars gallery is offered for you here. When my friend first saw the works of Ankars she said: 'I knew that it was beautiful, but I couldn't imagine that it was so beautiful!' Now you have a possibility to look at these wonderworks! In Ankars photo gallery you will take enjoyment in looking at copyrighted works, and works of other masters. Beads always store in themselves a riddle. They evenhave a very ancient history sated with adventuresand passions. In Africa, beads were in a course instead of money, in America Indian shaman by tradition entrusted a mascot to a newborn child, which was stored in a beaded bag on its neck, and in Venice, where the most high-grade beads were manufactured, according to the law for disclosure of the secret, which covered the aspects of manufacturing such kind of beads, capital punishment was sentenced. That time beads were almost at a weight of gold. In old time glassbeads have reached even the peoples of the Far North, which loved to embroider their clothes with beads and make various ornaments using them. If you are lucky to see tiny ancient beads, you will be surprised with its insignificant size. To use it you would need a lens because of their incredibly small sizes. Now beads are popular in many countries. In my gallery there is a collection of modern beadworks, both copyrighted works and works of other masters are published there.Enjoy visiting it. Tatting is an ancient technique of fantastically thin lacemaking, which history counts more than 300 years. Historians suppose that this technique primarily arose in ancient Egypt and China. Then in XVI - XVII centuries it was distributed in Italy and France, further in Europe and America. Now this technique is famous in the whole world. This is an amazingly thin open work, which produces an effect of ornamental contrast and free space. Tatting is a thing that really captivates. Weird geometry of tatting ornaments arises out of usual ring interlacement and bent arches, which as in a fairy tale appear in dexterous hands of lacemakers. Exquisite table-napkins, women's garniture ornaments, jewelry, handkerchiefs, jackets, even pictures and toys - all these are tatting. Tatting technique may be used in decorations for windows and Christmas trees. 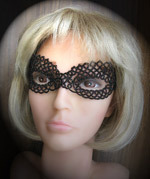 You may see tatting on elegant collars, towels, kid hats, fashionable accessories, bookmarkers, fine souvenirs, cards, decorated Easter eggs and Christmas toys, lacy flowers, and finally elegant and stylish women's adornments represent all sorts of using tatting technique in our time. 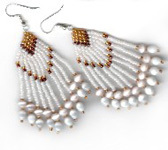 This gallery covers a collection of manually made earrings, traditional earrings of American Indians, old and new technologies, Ankars earrings, original design. It is a pity that the thin manual embroidery became so rare, since there are a lot of perfect and lovely things, which were laboriously decorated in the winter evenings by diligent handworkers. In this gallery it is possible to find one of very rare directions of handwork art. Whether you want to find out what this is or if you are trying to know more about it, I invite you to the gallery of embroidery. After acquirement of the machines, needleworks are almost on the verge of the extinction. It never could be told about manual knitting. Manually knitted clothes always look very fashionable. Probably because of the creator's love and individuality. Irish knitting is incredibly beautiful, so as unique knitted laces of the city called Brugge. And strangely enough, in old kind Ireland knitting was the main employment for men, where the fishermen were glorified by warm sweaters, which warmed them during sailing at sea. They were manually decorated with fantastic ornaments and tracery. If you have never heard about this type of handworks drop into this page. And even if you are a real master you will certainly find something unusual here.